A joint Defra, FSA, FSS and Government Chemist workshop was held at LGC on 28 February 2018. The event focused on the detection of allergens in spices and herbs using a multi-discipline approach. The workshop was attended by over 20 delegates from Public Analyst laboratories, industry and regulating bodies. The event was organised by the Government Chemist team as part of a cross government (BEIS, FSA, FSS and Defra) knowledge transfer project that will deliver knowledge from government programmes to stakeholders to help enforce current regulations and prevent future disputes. By pooling funds from each of the four government departments, knowledge transfer events can be planned and coordinated according to priorities received directly from the stakeholder community delivering greater impact. The workshop was opened with a talk by Dr Chun-Han Chan from the FSA’s Allergen team and followed by Greg Corbishley from Barts Spices, who gave the industry perspective into the challenges posed for manufactures by cross contamination. There were also three sessions covering the complementary techniques developed in response to the cumin and paprika cases in 2015. Malvinder Singh (LGC) talked about the immunoassay tests which initially detected allergenic contamination (initially believed to be almond) in cumin and the subsequent preparation of reference materials needed for further investigation. 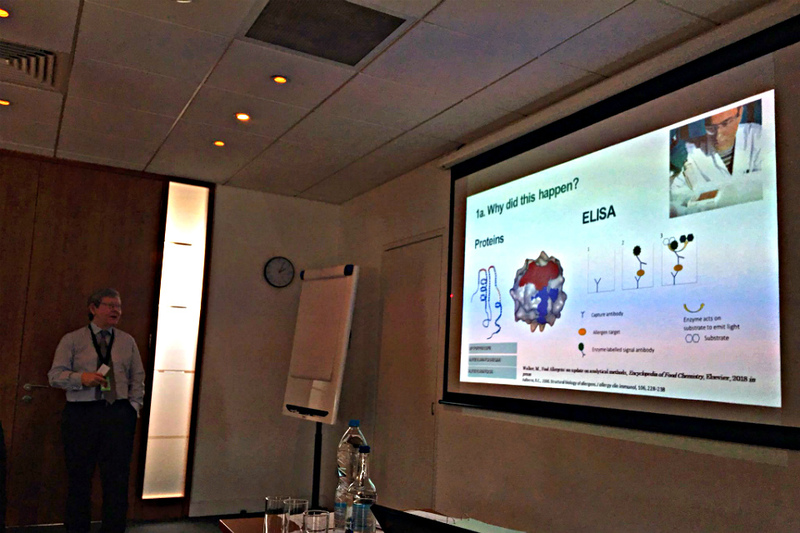 Chistopher Hopley (LGC) gave an overview of mass spectrometry and expanded on methods developed for the detection of close species. Timothy Wilkes (LGC) talked about the real-time PCR and melting curve approaches used for these cases. These sessions provided practical information required to enable participants to carry out or commission similar analytical tests . Michael Walker, from the GC team, provided a final overview on result interpretation and reporting on allergen cases.